LUCKY EMERALD est situé dans LA plus belle communauté de villégiature près de Disney. Emerald Island Resort qui est à quelques minutes de Disney World seulement 2. 6 miles et un court trajet en voiture des boutiques et des restaurants. L'île d'Émeraude est un refuge du monde plus vaste tout en restant au centre de tout ce que la destination la plus populaire du monde a à offrir. Principales attractions, parcs célèbres, restaurants et golf. S'il vous plaît prendre soin de notre maison comme si c'était la vôtre. D'autres personnes, dont nous-mêmes, veulent profiter de toutes les commodités de Lucky Emerald. 3 salles de bain complètes avec beaucoup de serviettes fraîches, sèche-cheveux en tout. We absolutely loved the house. It was very clean and had everything needed and more. Very pleased. We would recommend. Thank you for making our vacation a success!!!!! House was very comfortable with all amenities. Bedding was comfortable, plenty of towels for all and all kitchen supplies that we needed. Majority of things within the house seemed to be in working order and in good condition. There were a couple of things that did not seem to be up to the standards of the house and area - duct tape being used to hold carpeting between bedroom and bath, a rag blocking a hole in screen door leading into pool area, water leaking from a/c unit and some of the bedrooms were not able to be cooled down as much as some would have liked. Although not major issues, it just did not seem to fit the way the area presents itself. 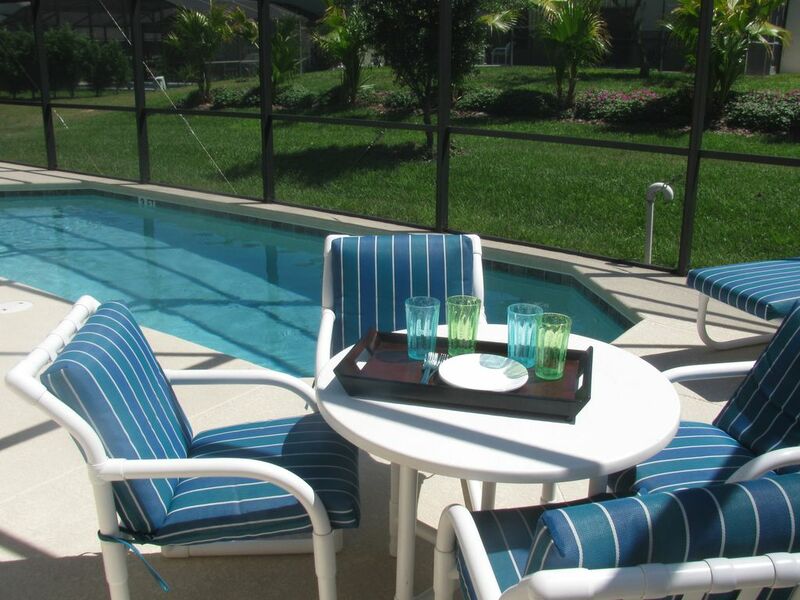 Location is excellent for visiting theme parks and is very close to stores and restaurants when not in parks. Houses are somewhat close together and if you have partying neighbors, it could be somewhat disturbing. Overall a good week and comfortable stay for 8 family members. Overall everything was exactly as the owner described. Everything was perfect. The beds were clean and the house itself had everything we needed. The only thing, the screen door was broken on the bottom and there was an infestation of flies that kept coming in. We tried to stuff the hole with paper towels, but to no avail. Other than that everything else was great. We will definitely be back. Thank you for writing your review. We are glad you had a great time. The screen door has been fixed. Please come back soon! The house was wonderful, very well maintained and one of the cleanest we’ve rented. This house has something for everyone young and old to stay entertained on rainy days. My family rents homes at Emerald Island every time we visit and this was definitely one of the cleanest, well maintained we stayed at. The kitchen was very well equipped with newer appliances and every gadget you’d need to prepare a family meal. Single story was prefect for young children. Very, very pleased! Le Lucky Emerald est situé dans le complexe de villégiature de luxe de la communauté d’Emeraude, à 3 km de Walt Disney World. Il est sécurisé et gardé pour votre sécurité ultime. Il est proche des principales attractions, notamment les studios Disney World Universal et Sea World, entre autres. Il y a de nombreux restaurants principaux, des magasins, du golf et des activités locales à proximité. Après une journée bien remplie, rentrez dans une cuisine entièrement équipée et détendez-vous dans votre piscine privée. Profitez de tout le confort de votre maison. Terms & Conditions By making a reservation, you automatically agree with our Terms and Conditions. 1. This villa requires an initial 50% non-refundable payment to reserve. The remaining 50% balance is due 15 days prior to arrival. (total cost including rental, tax, & fees) We accept major credit cards and electronic checks. 2. The rental rates listed above, do not include 13% Florida tax (7% state and 6% tourists) required by law. 3. A $49 Property Damage Protection fee will be applied to your total balance. 4. Pets are NOT permitted in the villa. 5. Pool heat is an additional $25 per day/ $150 per week September through May. Pool heat is not needed June thru August. 6. No cleaning fee is charged if the unit is left reasonably clean, otherwise a $100 fee will apply. This home is professionally cleaned upon departure. 7. This home has a unique time-sensitive keyless access code, which will only work during your stay. 8. Your specific code along with directions will be sent by email prior to your arrival. Full payment will be received prior to this information being released. 9. NO-SMOKING ALLOWED. 10. Maximum occupancy is limited to 10 people (including children) required by law. 11. Check-in after 4pm, check-out by 10am. 12. RV's are required to be parked off site. 13. You must be at least 21 years old to rent this property. 14. The villa is privately owned; the owners are not responsible for any accidents, injuries or illness that occurs while on the premises or its facilities. The owners are not responsible for the loss of personal belongings or valuables of the guest. By accepting this reservation, it is agreed that all guests are expressly assuming the risk of any harm arising from their use of the premises or others whom they invite.